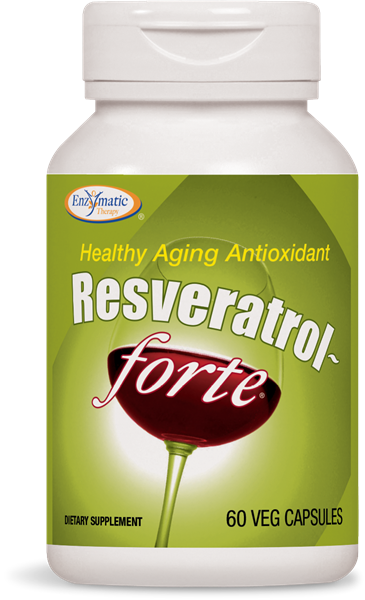 What type of grapes are used in Resveratrol-forte®? Resveratrol-forte® is made from red grapes grown in southern France. The extract is a mixture of Syrah, Merlot, Cabernet, and Carignan grapes. How does resveratrol contribute to healthy aging? In the search to replicate the benefits of calorie restriction (CR), resveratrol, a polyphenol found in the skin of grapes and in red wine, has shown the most promise for support of healthy aging. * While the exact mechanism of action is uncertain, it is thought that resveratrol works primarily in two ways. It activates siRT1, an enzyme associated with longevity. * And secondly, resveratrol supports the growth of healthy new energy-producing cell structures. *Healthy aging is an emerging research field. Considerable evidence has demonstrated that reducing calories consumed can increase lifespan, improve stress resistance, and maintain physical function. Animal studies have consistently shown that mice fed adequate vitamins and nutrients but 40 percent fewer calories, live up to 50 percent longer than mice fed usual diets. Why is the trans-isomer of resveratrol more beneficial? Resveratrol has two chemical forms or isomers. The most biologically active is the trans-isomer. What is the strong odor of Resveratrol-forte® attributed to? One of the ingredients in Resveratrol-forte®, resveratrol, is extracted from Japanese knotwood (Polygonum cuspidatum), a perennial plant with a distinct odor. This odor can vary in strength but the overtones are characteristic to the material.